Chances are the day will come when you inadvertently leave your VMs running overnight and you wake up the next day to find a) the complimentary monthly Azure credits associated with your MSDN subscription have been completely used up or b) your MSDN Dev/Test Pay-As-You-Go Azure subscription is facing whopping charges and you have some explaining to do. In this fifth instalment of my blog series on Continuous Delivery with TFS / VSTS we look at how to guard against these situations. Each alert allows for two email addresses to be contacted when the appropriate threshold is triggered. The thresholds can either be Monetary Credits or Billing Total and you'll need to choose according to whether your subscription has complimentary credits or whether you are accumulating a debt. The billing alerts feature isn't foolproof though -- at least not unless you have your phone by your bedside with audible notifications enabled. And it won't help you if you can't get to a computer to shut down your VMs. Enter stage left -- Azure Automation! Azure Automation allows you to do, er, automation in Azure. The net effect is a bit like Windows Task Scheduler, in that it allows you to create jobs that can be run on a schedule. The resemblance ends there though as setting up Azure Automation is nothing like setting up Task Scheduler. There are quite a few moving parts to configure to get automation up-and-running and at the time of writing it is further complicated because ARM cmdlets are not recognised in the out-of-the-box automation configuration. We'll be covering the steps needed to run a PowerShell script that will loop through all VMs and turn off ones which are not running and are not a domain controller, and then make a second pass to turn off any running domain controllers. In case you were wondering there's no magic in the domain controller recognition -- just that I name any domain controllers with a DC suffix and don't use DC for anything else. Azure Automation doesn't work with Microsoft accounts (typically this is an account that uses your work email address and the one you use to log in to Azure and MSDN). Instead you need to create an organisational account in Azure Active Directory. The instructions for this are here and at the time of writing this functionality is only available in the classic portal. I created an account called Automation. 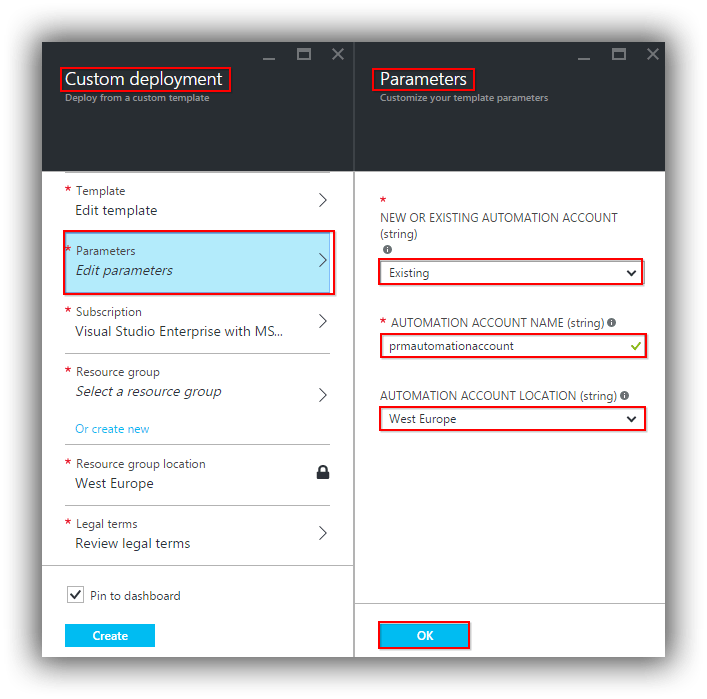 New-AzureRmAutomationAccount -Name prmautomationaccount -ResourceGroupName PRM-COMMON -Location "West Europe"
Obviously change the values of the parameters to suit your requirements. Obviously I've changed a couple of things above for security reasons but you get the idea. If you want to observe the effect of the code above head over to the new portal and navigate to Automation Accounts > $YourAutomationAccount$ > Assets > Credentials. You should see that the organisational account has been added and (as we'll see below) can be referenced from a PowerShell script. At the time of writing a newly created automation account doesn't know anything about ARM, although by the time you read this that may have been fixed. By way of further explanation, in the new portal navigate to Automation Accounts > $YourAutomationAccount$ > Assets > Modules. What you see here are the modules that contain PowerShell cmdlets that you can call from the automation account. If this list doesn't have what you need you need to manually add whatever module is missing. In our case we need the AzureRM, AzureRM.Compute and AzureRM.profile modules. 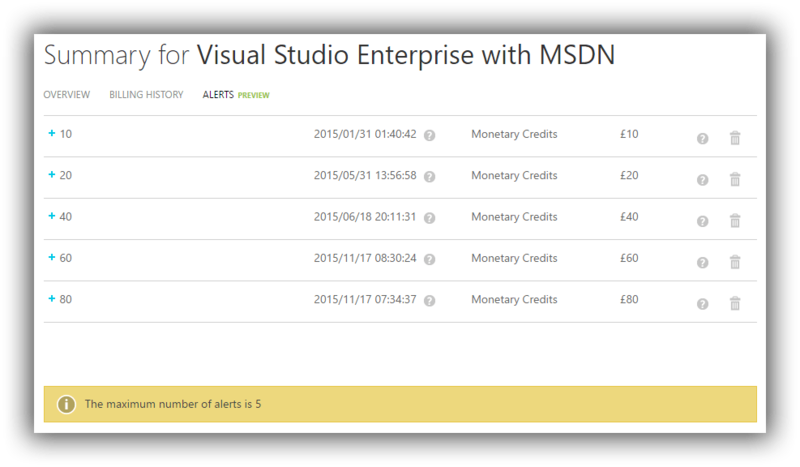 We can conveniently get these from the PowerShell Gallery. The screenshot above shows the Parameters section being edited. Be sure to save the section by clicking OK before moving to a new section. When all sections are complete clicking Create will deploy the module to the automation account. There isn't any real magic here -- if you look at the JSON template it is just uploading the module from its location on https://devopsgallerystorage.blob.core.windows.net/azureautomationpackages. You'll need to repeat this process for AzureRM.Compute and AzureRM.profile. At the time of writing there was no button for AzureRM.Compute. No matter, you can achieve the same effect by pasting a URI similar to this in to your browser: https://www.powershellgallery.com/packages/AzureRM.Compute/1.1.0/DeployModuleToAzureAutomation. The preceding URI is specific to version 1.1.0 of AzureRM.Compute -- obviously you may need to tweak for a newer version. $Cred = Get-AutomationPSCredential -Name "Automation"
Add-AzureRmAccount -Credential $Cred -SubscriptionId "zyb4a111-7e0b-1111-df9d-x4a160567809"
Paste your version of the above in to the editor and click on Test pane. From here you can run the code and note any errors. It's then back to Edit to make any changes, which you should save before going back to the test pane. When all the kinks are ironed out click on Publish to make the runbook live. The preceding code sets up a schedule to start at 01:00 the next day. You'll need to remove .AddDays(1) if you are working just past midnight. As a final test it's probably a good idea to create a scratch A0 VM and leave it running to confirm next day that everything is working as expected. The beauty of this technique is that execution only tales seconds so you don't have to wait for the ISE (or whatever you are using) to finish its business. Of course if you don't have access to PowerShell you can always use the portal.